Over 40 Amateur Of The Week: Old Enough To Grow Better! It's not a mistake that Frank is ripped at age 57. He visualized this moment, believed it was possible, and committed to a journey based on hard work and sacrifice! I have been athletic from as far back as I can remember. I started playing Pop Warner football in New York at age seven. I was smaller than most children my age and had to work longer and harder than everyone on my team. I started lifting weights at age 14 to build strength and supplement my football skills. During high school, I continued to play football and ran track. I always had to work harder than my peers to stay ahead of the rest. My belief in fitness and health was instilled during my early teens and took me on a journey that I still travel today. Working hard to achieve my goals became the cornerstone of my personality. My love for football wasn't enough to get me recruited to play in college. I was simply too small, but that didn't deter my spirit. I played for an adult amateur football league without the notoriety of college stardom. During that time, with the help of weights, I achieved a maximum weight of 180 pounds and became the starting running back. After college graduation, I retired my helmet and no longer needed the muscle required for football. Middle distance and marathon running became my passion. During the following 3-4 years, I reduced my weight from 180 to 129 pounds. As a distance runner, it wasn't uncommon for me to train 75-80 miles per week. Running was my sport of choice for the next 10 years. During that time, I completed countless road races of varying distances and three marathons. One of my proudest achievements was running six-minute miles for the duration of a complete marathon. My best finish was in my last marathon where I finished 60th in a field of more than 5,000 runners. I relocated to Scottsdale, Arizona, when I was 39 years old and running became a challenge during the summer months. My need to stay active renewed my interest in weightlifting. The next 10 years were comprised of a healthy balance of running and weightlifting. During these years, my weight stabilized at approximately 155 pounds and 15 percent body fat. I felt great, but knew there was more to achieve. Eventually, my time in the gym outweighed my time on the road. As my miles decreased, my weights increased, which resulted in an increase of lean muscle and a decrease of body fat. With little to no effort, I was being transformed. I continued down this path and my thirst for knowledge became greater. I decided to become a certified as a personal trainer and felt a strong need to learn as much possible about the sport. I became my own experiment. My goal was always to increase lean muscle mass and decrease body fat, so I created a plan and worked toward my goal. As the months passed, I received encouragement from gym members and was often asked for advice. I was onto something. My goal was to resemble a fitness model. Competing in bodybuilding was never on my list of feats to accomplish, but after being asked repeatedly if I competed, I started to think about it. After much encouragement, I hired a trainer and set a goal to compete. My first competition was in November at the 2012 NPC Western Regional Competition in Mesa, Arizona. 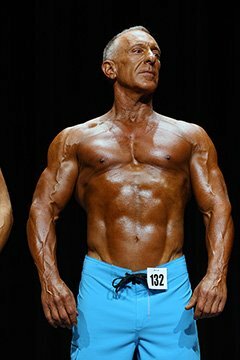 I entered the physique category for men over 40 years old. There were five finalists. Four were 40-41 years old and I received the third place trophy at age 57. I vary my workouts constantly every 4-6 weeks and switch between heavy weight and low reps and moderate weight with high reps. I vary my exercises, intensity, tempo, and equipment. I lift as heavy as I can as often as I can. Every exercise starts with three warm-up sets followed by 5-6 sets of 6-8 reps. I generally lift six days per week and do legs twice per week because they need more attention. I alternate abdominal work and calves every other day and cardio HIIT (High Intensity Interval Training) at least twice per week. My daily routine takes 2-2 1/2 hours. I'm usually on a low-carb, high-protein meal plan with 2,000-2,500 calories. It varies if I'm trying to gain muscle or lean out for an event or show. In weight-gain mode, I eat 3,000-3,400 calories with complex carbs like sweet potatoes, whole wheat pasta, and whole wheat bread. My cardio is limited to once per week. When I lean out, I cut back on calories, reduce carbs, and increase cardio. Supplements can make the difference between being good and great. However, if your training, cardio, nutrition, and lifestyle aren't in line, then supplements might not make much of a difference in your results. As we age, supplementation becomes even more important. We need to replace what our bodies no longer produce. For those over 40, I recommend you see a health specialist. I use a naturopath who specializes in hormone regulation. Nothing of value in this life comes without hard work. Hard work makes us appreciate what we achieve—the harder the work, the greater the appreciation. I'm thankful for a healthy body and mind and it's my responsibility to take care of that body; not only for myself but for those who depend on me for support. As humans, we create our own reality by the way we think. Every other animal on earth reacts to its environment, but humans create their environment or reality by what they believe to be true. By programming my subconscious mind through positive affirmations (positive self-talk) and active visualization (visualizing in my mind in great detail), I can do, have, and become anything I want. When I believe I can achieve a certain goal, the outside world will change to match the belief I created for myself. This is how goals and achievement work. Bodybuilding affords me the opportunity to set a goal (belief), create a plan to reach that goal, and work hard to achieve that goal. For example, when I see, in my mind's eye, the physique I want to attain or the trophy I want to win, I start to do all that's needed to achieve that goal. The mind cannot hold two conflicting thoughts at the same time. Either you will give up on your belief (goal) or your reality has to change to match the belief you created for yourself. If you believe in your goal, then you have no choice but to attain it—no other outcome is possible. This thinking works in bodybuilding and in every other aspect of life, like jobs, relationships, etc. Most people think you have to see it to believe it. The reality is just the opposite; to see it, you must first believe it. Ask yourself, what do I believe about myself? If you like the answer, fine, but if not, know you are in control. You have the power to change your beliefs. I have always been motivated by successful people, especially people who overcome great adversity to achieve success. I had many mentors along the way. The secret to my success is I know that life doesn't discriminate. If I want to be successful, I do what successful people do: develop the habits of success. They differ slightly from individual to individual, but there are some common threads like hard work, determination, goal setting, and an indomitable will. All of these are hallmarks of successful people. To achieve your goal, you have to pursue that goal with such intensity that the average observer will think you're absolutely insane. If I had to pick one role model it would be Arnold Schwarzenegger. He's the embodiment of success. We are all aware of his accomplishments in bodybuilding, acting, and politics—all from an Austrian immigrant who came to this country with nothing. Study his life, read his autobiography, read his quotes, think like Arnold, and you will be successful. My inspiration mostly came from within. Even as a child, I refused to give up or give in. Many people told me I was too small or not smart enough for this or that. My innate response was to prove that I could do what they said I couldn't. Today, my inspiration comes from my wife and childrenc. My wife went back to school after 30 years and received her bachelor's degree from Arizona State University and has a successful real estate career. My daughter graduated from college, packed her bags, and moved to New York City alone to pursue her dream. My son attended community college at the Conservatory of Recording Arts and Science and went on to ASU for a bachelor's degree and a successful career as an audio engineer and technical director. That's true inspiration. My short-term plans are to compete in the NPC Western Regional Competition in Mesa, Arizona, in November. I will compete in the men's senior master's bodybuilding class. I'm currently working with my trainer and will work with a posing coach as my competition date nears. My goal is to take home the first-place trophy. My long-term goal is to be fit until the day I die. You have to believe that you can win. People ask me all the time, "How can I look like you?' My answer is: "First, you have to believe you can." In addition to belief, consistency and focus are equally important. I traveled extensively for most of my professional life (32 years) and maintained a strict fitness regimen. I traveled to different cities and always researched where the nearest full-service gym was, followed by the best steakhouse. It's nice to make friends and be welcomed back to the gyms I frequently visit while traveling. I know some people use business travel as an excuse not to work out and eat healthy, but with proper focus and a "no excuse" mindset, I find the road an opportunity to enhance my non-traveling routine. As mentioned earlier, Arnold is my favorite. 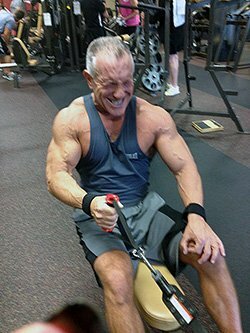 I constantly search Bodybuilding.com for new training techniques, supplements, and inspirational stories. 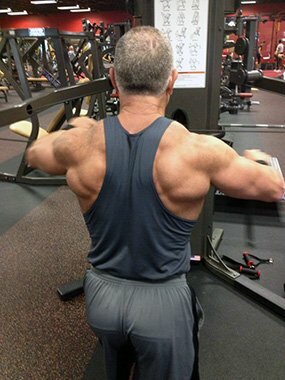 My favorite articles are about older men and women who transform. I always search BodySpace for progress pictures of men and women over 40 to see their amazing transformations. Whenever I Google a bodybuilding topic, an article by Bodybuilding.com appears.